American cockroach adults grow to an average length of around 4 cm (1.6 in) and about 7 mm (0.28 in) tall. They are reddish brown and have a yellowish margin on the body region behind the head. Immature cockroaches resemble adults except they are wingless. The cockroach is divided in three sections; the body is flattened and broadly oval, with a shield-like pronotum covering its head. A pronotum is a plate-like structure that covers all or part of the dorsal surface of the thorax of certain insects. They also have chewing mouth parts, long, segmented antennae, and leathery fore wings with delicate hind wings. The third section of the cockroach is the abdomen. In an experiment carried out at the University of California, Berkeley in 1991, a Periplaneta americana registered a record speed of 5.4 km/h (3.4 mph), about 50 body lengths per second, which would be comparable to a human running at 330 km/h (210 mph). It has a pair of large compound eyes, each having over 2000 individual lenses, and is a very active night insect that shuns light. American cockroaches generally live in moist areas, but can survive in dry areas if they have access to water. They prefer warm temperatures around 29 °C (84 °F) and do not tolerate cold temperatures. These cockroaches are common in basements, crawl spaces, cracks and crevices of porches, foundations, and walkways adjacent to buildings. 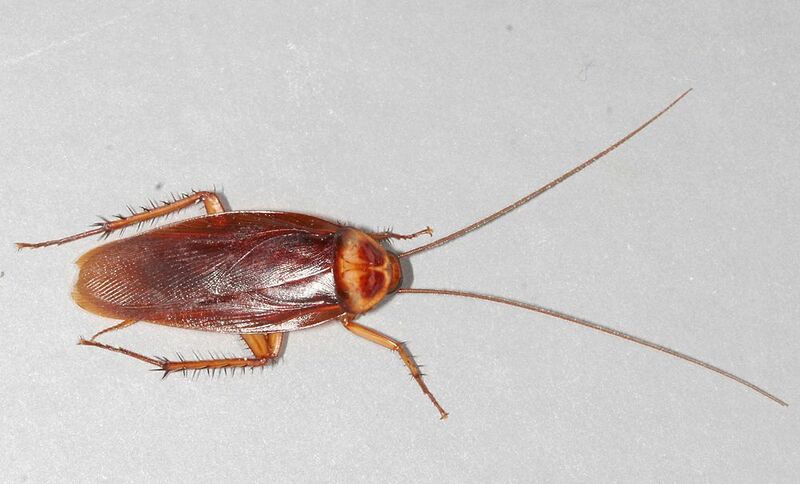 In residential areas outside the tropics these cockroaches live in basements and sewers, and may move outdoors into yards during warm weather.